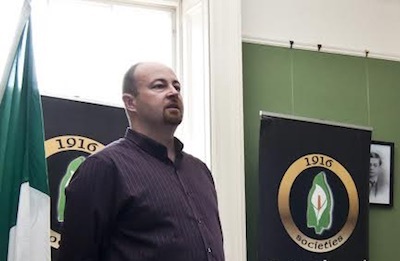 The 1916 Societies recently launched a petition for an All-Ireland Referendum on Irish Unity. This address on the campaign is by Barry Monteith, an independent Councillor from Tyrone, with a link to the petition below. Today we as a people, North and South, are experiencing a great economic crisis, one similar to that which blighted the lives of millions of working people in the 1930’s. A generation is being lost to unemployment, poverty, emigration and oppression. This crisis in our country was created by the political and financial elites, both here in Ireland and across the world. The ideals of freedom, unity and democracy, held by the Volunteers of 1916 and those that followed, are more important now than ever. We owe them all a debt of gratitude and lessons remain for us today. It is better to stand on your own feet with dignity and to struggle for a better world than to live on your knees, cowed before the forces of colonial imperialism: the British intervention in Ireland, the European Union, the United States, to be corralled and herded by their financial instruments of control the ECB, the World Bank and the IMF. The men and women of 1916 had the courage to dream that a better life was possible. Their dreams were greater than the small minds that have controlled our people, that have crippled and blighted us as a people, intellectually and culturally. This war on Irish identity continues and thrives today. The ancient, proud and noble sense of Irishness we all share is the target of numerous strategies that seek its removal from modern Irish society. These attempts to create an artificial ‘Northern Irish’ identity flow every day from London, from Westminster and from Stormont. We must rise to the challenge as those brave Irish men did before us. To dream but more importantly to act for a better tomorrow, to engage with our fellow country men and women, to foster and instil the ideas that they and they alone have the right to decide Ireland’s destiny. We, the Irish people, have the ability to mobilise and struggle together for a new all-Ireland democracy that draws our people together, working and co-operating together to build a people’s republic based on sovereignty and on unity - a republic free from outside interference, established by the people and for the people. For as Connolly said, ‘Ireland without its people means nothing to me’. Many in Ireland feel politics is alien to them, that politics is something done to them and on them, rather than being part of. Often it is hard not to be disillusioned, cynical and disengaged when we watch the poor of the world forced to pay for the extravagances of the financial and political elite. But this campaign gives an opportunity to the people of Ireland to rediscover their citizenship, their ownership of their own destiny. A chance to free their country democratically and peacefully. In September last year our Celtic Cousins in Scotland were given the opportunity to vote for their freedom. Despite narrowly missing out on independence, politics in Scotland has been transformed - changed utterly. A second referendum, with a yes vote this time around, is now a very real proposition in the next few years. The people of Scotland rediscovered their democratic rights and interest in independence is at an all-time high. We have to ask ourselves as a nation, why can’t Ireland be the same? Why can’t we have the opportunity as one people to vote for our freedom? Why can’t the people of Ireland decide their own destiny? One Ireland One Vote is a simple message - give the people of Ireland the opportunity through a referendum to decide on the re-unification of our country. ‘Should Ireland be a united independent country?’ The Irish people must have the opportunity to answer that question. I have no doubt they will answer it with a resounding yes. It is the right of the Irish people to national self-determination. We demand this be recognised in the form of a 32-county referendum on Irish Unity. It is the citizens of Ireland who have the absolute and sovereign right to decide the future of this island, it is for them and they alone, free from external impediment, to choose their own destiny. National self-determination, expressed through an all-Ireland referendum, will give every Irish citizen a fair say on the partition of our country and speed the formation of an independent democracy to replace its legacy of failure. A referendum on Unity offers renewed opportunity to advance the republic, a republic as that outlined by Pearse when he read the Proclamation in 1916. Such a referendum would give the people of Ireland the power to create a sovereign and democractic Irish Republic in accord with our national rights, to finally carve our own destiny as a free people before the nations of the world.